Last weekend we attended our last show of our summer season. 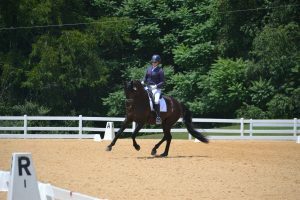 The competition season here in Virginia starts in April, revs up through May and June and culminates in one big show mid-July, after which it gets beastly hot and unpleasant, and it’s terrific to be able to give the horses the rest of July and all of August to basically flop around and have a breather. I also taught my last get-on-a-plane clinic for a while, which means that other than a few events on the farm, and a one-day show about 15 miles from my farm, I get to be HOME, with a NORMAL SCHEDULE, until September.